Now here's something that's reeeeaaaalllly easy to do and yet it's so yummy it's sure to become a hit with whoever you serve it to. Make your very own garlic toast! Perfect companion to your pasta dish. And you can use any type of plain bread available in your house. The quantity of above ingredients depend on the number of garlic toasts you will make. Get the biggest clove of garlic in the bulb. Remove the skin, then cut it diagonally on one end. You need to get the most surface out of the cut area and at the same time you are still able to hold on to the garlic. Crush it ever so slightly just to make the juice ooze from the cut side. Get more garlic cloves, remove skin, crush and chop finely. You may also grate if you want to, although I prefer chopping and coming up with different sizes of garlic bits. Now, get your bread and wipe the cut side of the garlic onto it. In my case, all I have is loaf bread so that will do. Only one side is needed for the garlic treatment. Although the smaller, round bread varieties is ideal. In which case you need to slice the bread in two. Dab it, wipe it... transfer that garlicky taste onto the bread. You only need to do it on one side. When you're done, crush and chop this garlic clove to go with the rest. 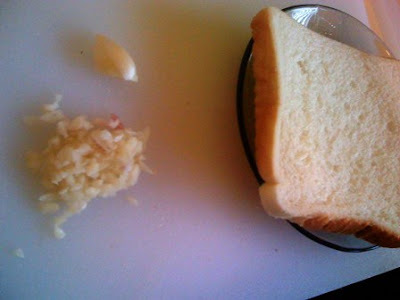 Next, sprinkle or wipe chopped garlic pieces onto the bread. Remember, just do this on one side if you have loaf bread. Melt the butter on a pan over medium heat. When the butter is melted through, place your bread on it, garlicky side down. Let it "cook" for a minute. Serve with your pasta dish. 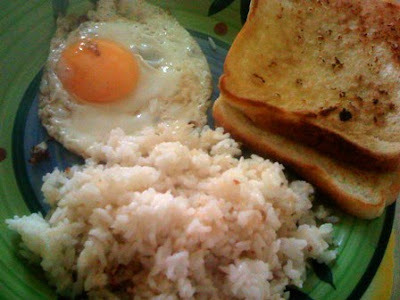 Or in my case, this is a breakfast item so I served it with fried rice and sunny side-up (which my wife loves).